Spring Bank Cottage015395 32606work015395 32606fax Self-cateringSpring Bank Cottage is peacefully situated in a lovely location in the countryside, yet only a few minutes by car or foot from the centre of Grange-Over-Sands. Probably the best views in the area can be enjoyed from the cottage, the view over Morecambe bay and surrounding Lakeland hills is magnificent. Completely renovated, cosy and beautifully appointed, the cottage is furnished to a very high standard. On a family farm and personally cleaned and maintained by the owners, the family have been welcoming visitors to the cottage for over 60 years. There are 1 double and 2 twin rooms plus a cot. The price includes electricity, hot water, heating and linen. At the front is a large lawn and garden and at the rear and side an extensive, safe children's play area. Private parking for several vehicles. Free WiFi is available. This is an excellent walking area with numerous walks from your front door. Grange-Over-Sands is a charming, small, Edwardian seaside town, renowned for its mild climate. There are tropical and ornamental gardens, a promenade and award winning shops. Locally are many good eating places including in the ancient village of Cartmel (1.5 miles away) which also has a 12th Century Priory and well known Racecourse. The heart of the Lake District, with attractions such as Lake Windermere, Coniston Water and Tarn Hows, is a few miles inland and within easy reach. Spring Bank Cottage offers weekly bookings starting on Saturday. Discounts for couples off current rates. Three bedrooms, 1 double and 2 twin-bedded rooms. 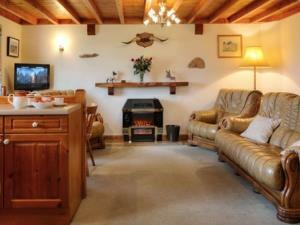 The cottage is very comfortable, spotlessly clean, prettily furnished and well equipped. It sits high on a hillside with wonderful views, and has lovely country walks direct from the door. 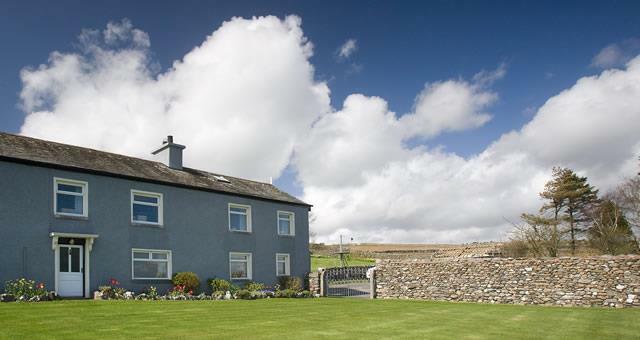 The location gives easy access by car to visit the attractions of the Lake District. The owners gave us a warm welcome and were very friendly and helpful. We have stayed in many self-catering cottages, and this is definitely one of the best. Thank you for your lovely comments. We are very pleased you enjoyed our cottage and your stay with us. Spring Bank Cottage is peacefully situated in a lovely location in the countryside, yet only a few minutes by car or foot from the centre of Grange-Over-Sands. Probably the best views in the area can be enjoyed from the cottage, the view over Morecambe bay and surrounding Lakeland hills is magnificent. Discounts for couples. Short breaks available. Cooking by electric, electric shaver point. Children welcome from any age. From M6 jct 36 follow A590 towards Barrow. Leave the A590 at Lindale roundabout and follow the signs for Grange-over-Sands. Take Fell road over to Cartmel. After approximately 1 mile take the sign to Spring Bank Farm at the end of the lane, on right-hand side of the road. Nearest train station Grange-over-Sands, 2 miles.